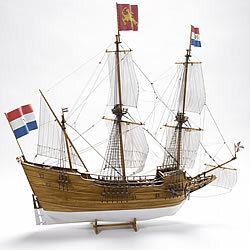 Billings Boats BIL450 Half Moon 1/40 scale wood ship kit! Henry Hudson (1565-1611) was an English explorer who received a commission from the Dutch East India Company to find a Northern trading route to China and Japan. In April 1609 he sailed North and East on the ship the “Halve Maen” to try and find a route around the northern shores of Russia in order to reach the Pacific Ocean that way. After several attempts, which always were stopped by the pack-ice, he crossed the Atlantic to try and find a route north of America. On this voyage he sailed up the Hudson River as far as Albany.